It is the cricketing shot played by the batsman using the front leg by transfering the body-weight on it. In fact the batsman tries to transfer his body-weight naturally on the front-foot to play fuller length or good length or some times shorter length deliveries. In general the good length and fuller length deliveries are played on the front-foot. The shots like leg glances, straight bat drives in mid-on and mid-off regions, drives in cover region, square cuts, wristy shots on leg side region can be played on the front-foot. And some of the special shots like scoop shots, reverse scoops, conventional sweeps, paddle sweeps, reverse sweeps, slog sweeps, flicks on the leg side region, shots played by moving down the track can be played properly only by using front-leg. It is very difficult for the batsman to play these special shots on back-foot. How does the batsman play a shot using the front leg ? Before the batsman starts using his front leg the batsman has to make sure himself how well his front leg is comfortable and ready to move forward or open on the spot in time from position zero (Batting guard) when the pitch of the ball happens. So the basic and foremost step by the batsman would be the way how he stands in or outside the crease while taking the guard. And if a batsman stands on with a legs of too less distance the biggest mistake he does is he himself locks his feet with out giving any real comfortable freedom for the front leg to move forward in time when required. Hence the batsman will not be able to get forward his front leg comfortably in time when he wants to play on the front-foot. Especially when the batsman wants to play a swinging fuller length or good length deliveries really feels difficult in picking them with this guard since these deliveries are mostly played on the front-foot by the batsman. From above we need to understand that it is the “Comfortable distance” which has to be maintained between the two legs by any batsman while taking guard. The word “ Comfortable distance “ is such an important word for any good batsman who would like to move his feet forward or backward comfortably with full freedom in time when required. At the end of the day with this guard the batsmen will be able to switch on their feet to move forward or backward with greater flexibility in time when required. Judging the pace and length of the ball, high back lift, balance, use of bottom-hand, front leg getting closer to pitch of the ball, zero gap between bat and front pad, still head, follow through, focus are the other important things to keep it in mind when a batsman plays on front-foot. The batsman simply cannot just use a front-foot to play a cricketing shot. Why only the front foot ? To get rid of lbw’s while defencing or playing any shot most of the good batsmen will try to get their front leg outside the off stump line so that the impact of the ball with the front leg pad would happen outside the line since we know that there would be no way of giving lbw’s once the impact of the ball with the pad happens outside the off stump line if a batsman plays a shot. When a ball swings or comes sharply into the batsman in a good or fuller length most of the batsmen use this tactic by moving their front-foot outside the off stump line. There is always a greater chance for the batsman to get lbw’s on the back foot since when a batsman tries to play on the back foot for an in swinging delivery most of the times it has to be played from within the crease which in turn the batsman himself creates a chance to get caught or stuck within the crease in front of the wicket once he misses the ball. We can see most of the good batsmen in the world specially in test cricket and during the initial overs of limited over matches will try to bring their front leg outside the off stump line while defencing the incoming deliveries to get rid of lbw’s. The main objective of bringing front-foot closer to pitch of the ball is to try and reach the ball as much as possible and also at the same time try to have control or dominate over the swing or spin of the ball either bowled in fuller or good lengths by converting them from good lengths to half volleys and half volleys to over pitching deliveries. Since we need know that reaching the ball with the bat and getting closer to pitch of the ball are the key concepts in playing any kind of proper cricketing shot. To get this job done there would be nothing better than usage of front leg especially for the incoming and outgoing deliveries bowled at good or fuller lengths. It is a much better and safer option than playing it on the back-foot. How ever when it comes to fuller length incoming or outgoing deliveries most of the good batsmen chose to play it right on the front-foot since when a batsman plays on the back-foot for an outgoing fuller length delivery most of the times the batsman has to play a shot away from the body which is always a dangerous option to chose. Reaching a ball with the bat is not only the criteria to look after but at the same time getting closer to pitch of the ball is also important to play a proper cricket shot as it is said earlier. The front leg does this job well in fulfilling both of these criteria. And when a batsman plays on the back foot for an in swinging fuller length delivery, most of the times the batsman will feel it difficult in picking them and also there is a high amount of risk in playing these kind of deliveries on the back foot since once the ball misses there is always a chance of getting bowled, lbw’s and inside edges. But when a batsman plays it on the front leg he will not only have a great chance of picking the delivery but at the same time can get rid of inside edges, lbw’s and getting bowled most of the times. 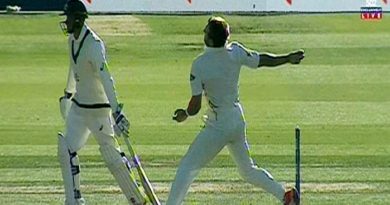 On the other hand when it comes to good length deliveries it is equally played both on the front and back foot. Depending on the ability and style of the batsman, some batsman like it to play it on the front-foot and some other on the back-foot and there is no harm in using the front-foot for an good length outgoing or incoming delivery as long as there is no great amount of bounce. But if there is a bounce it will be really difficult for the batsman to pick a bounce right on the front-foot specially the deliveries bowled at good lengths. But if it is a bouncy fuller length incoming or outgoing delivery most of the batsmen still manage it to play right on the front leg since it is a bouncy fuller length delivery it can be a half volley or over pitching delivery like if it is a bouncy over pitching delivery (incoming or outgoing), to the maximum extent the batsman will not have any problem in dealing with this fuller length delivery on front foot even if it swings. 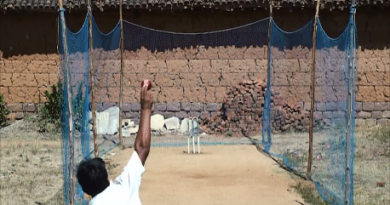 If it is a bouncing half volley (incoming or outgoing) and if it is played with a straight or vertical bat position the batsman will not have any problem in dealing with this fuller length delivery on the front-foot since even it bounces at half volley, to the most extent the ball still hits on the lower middle of the bat which results the ball to fly lesser height and lesser distance in the air. But if the same bouncing half volley is played with horizontal bat or cross-bat positions the batsman can be in trouble since there is always a chance of getting top edges. 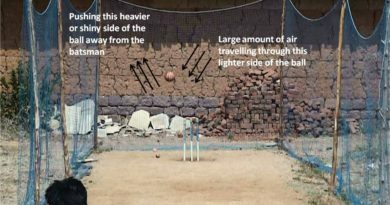 In some of the pitches like the track at WACA, Perth, Australia if the pitch is at its best the batsman will hesitate to play a bouncing half volley even with a straight bat position on the front-foot. Just imagine how the bouncing good length deliveries would be on this track. This is the reason which makes some of the batsmen even not to dare to bring their front leg closer to pitch of the ball on this track and makes them to play every shot on their back foot. Any way some how the moving and bouncing deliveries bowled at fuller lengths can be managed by most of the batsmen on the front foot but as we said earlier that it is really difficult for the batsman to pick a bounce on the front-foot for the deliveries bowled at good length, to overcome this most of the batsmen chose to play on the back foot since there will be always more time to judge the pace and bounce of the ball when a batsman plays on the back foot. Why the batsman feels it difficult in playing the bouncing deliveries bowled at good lengths or even some times at fuller lengths (Pitch at WACA) when he uses front leg ? When a batsman uses his front leg to play a shot the primary goal would be always to try and reach the ball as much as possible by bringing the front leg closer to pitch of the ball but in the process of trying to reach the ball naturally the batsman doesn’t wait for the ball to reach the bat in fact moves his front leg forward closer to pitch of the ball by bending his front leg knee a bit with a carrying bat along with it (the distance from the ground to the bat decreases) accordingly to the predicted conventional bounce of the ball which totally results in having very less time to react and judge the bounce of the ball. Hence if it is bouncing good length delivery (Not a conventional bounce) the ball which has to hit the middle of the bat (For a conventional bounce) will hit the handle of the bat or gloves of the batsman if played with a straight or vertical bat position thereby the batsman gets in trouble. And if the same bouncing delivery is played with cross-bat or horizontal bat positions the batsman gets top edges. But where as when a batsman plays on the back foot waits for the ball to reach the bat gets more time which is the key in predicting the bounce of the ball. Most of the times even good batsmen gets in trouble once the front leg is on to play a shot for an good length bouncing delivery. On a fast bowling track or a good batting track where the pace of the ball will be true, the ball reaches nicely to the bat it will be easy going for the batsman to play any kind of cricketing shot with timing using front leg either it may be bowled in fuller or good lengths. We know when the batsman plays a ball of good or fuller lengths on any track using front leg doesn’t get much time to judge the pace of the ball after pitching but on these tracks since the pace of the ball will be true after hitting pitch the batsman will have no problem in hitting the ball with pure timing. Hence to time the ball the batsman need not to have any bother about pace of the track on these king of pitches but just has to deal with foot work using front leg by getting closer to pitch of the ball. On slower tracks the pace of the ball will not be true, the ball doesn’t reach nicely to the bat it wont be easy for the batsman to time the ball using front-foot either it may be bowled in fuller or good lengths. Here on slower tracks the ball gets hold or stops a bit after pitching. By the time the ball reaches to the bat the batsman already plays a shot using front leg thereby mistiming the ball and creates a chance for the opposition by hitting the ball in the air. The batsman gets very less time to react to pace of the ball when he plays on front-foot which is the main reason makes the batsman to play earlier and get in trouble. On these slower pitches for a good length deliveries most of the good batsman try to change their style of batting from using front-foot to back foot. Since playing on the back foot the batsman always gets more time to judge pace of the ball than playing on front-foot. For fuller length deliveries the batsman still plays it on by using front leg but plays very lately as much as possible by weakening the bottom hand or by low back lift. Remember this theory or concept of using front leg can also be applied to spin bowling similarly as applied to fast bowling. Finally we need to remember that these are the basic rules to be followed by the batsman but today in modern days of cricket there are many good players who are really confident and succeeded in playing any kind of swinging or bouncing or any delivery on any foot at any length.